Tripp and Bronwyn are super in love and are basically the coolest. He works at an art museum and she’s an opera singer, and I had so much fun shooting their engagement photos earlier this year. Their wedding at the San Antonio Botanical Garden was tiny and intimate with mostly just their family there. Plus a violinist, a bagpipe player, and of course me! We got there early when it was pretty empty and unfortunately, it was drizzling and set to rain. It sprinkled a little but the rain mostly held off and the sun did come through later on for their portraits, so it all worked out! We’ve been getting so much rain that even now everything is still green and lush. They did the ceremony halfway under an awning facing one of the greenhouses there. It was short and sweet, with Tripp’s brother officiating and a hand fasting. We did a bunch of group photos inside one of the greenhouses with all these beautiful, lush jungle plants, and then I took Tripp and Bronwyn around the property to get more photos of just the two of them. The Botanical Garden is beautiful, and it’s pretty close to Austin. After the wedding, they got some lunch and I headed back to Austin. 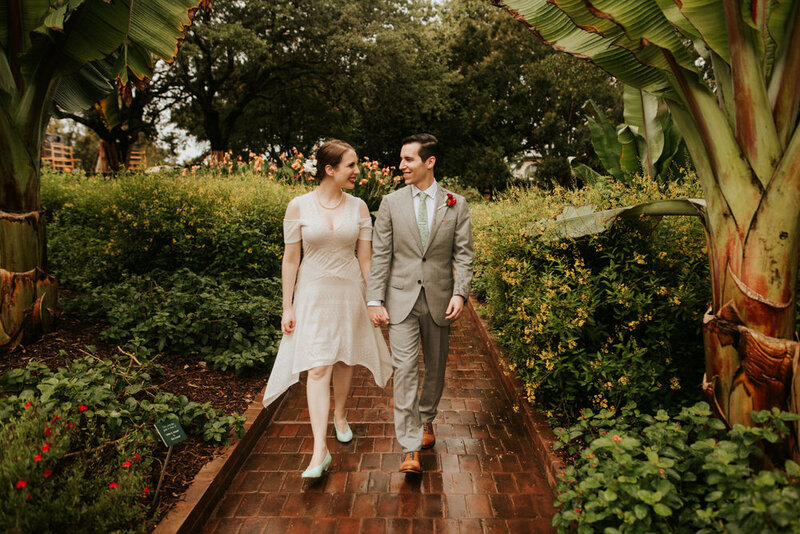 This was my first rainy wedding I’ve ever done (you’ll see umbrellas in a lot of the photos!) but no one got soaked. Scroll down to look through photos from this sweet wedding! Looking for a photographer to shoot your engagement or wedding? Click here and let’s talk!